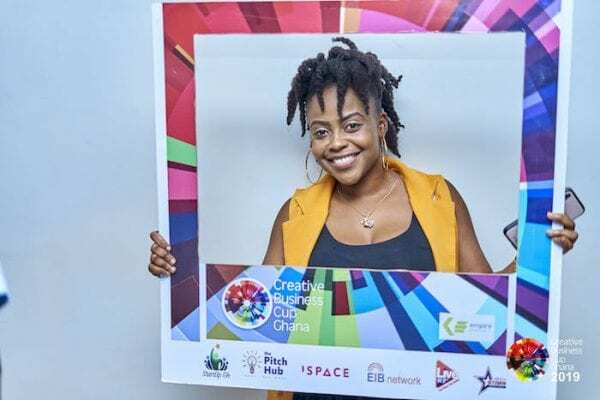 Empire Protocol, National Partners to the Creative Business Network (Denmark) have crowned Smaila Abubakar winner of the 2019 Creative Business Cup – Ghana National Competition. Mr Abubakar is CEO of Auto Hydro Plant, a startup that focuses on renewable/recyclable energy solutions and domestic needs. His award award-winning innovation which took the top prize, is an emergency, rechargeable, plastic LED light bulb. To demonstrate the efficacy of the bulb and its ease of use, he was able to illuminate the stage with a single bulb by moistening his finger with saliva and touching the base of the bulb. The National Entrepreneurship and Innovation Plan (NEIP) surprised Auto Hydro Plant with a cheque of GHc 20,000.00 to support the growth of their business. To this they added cheques in the amount of GHc 10,000.00 for each of the seven (7) Runner’s Up. The Creative Business Cup – Ghana capitalizes on the huge potential of Ghana’s creative ecosystem in order to prepare entrepreneurs to compete nationally and regionally to represent Ghana at the “Olympic games” of the creative industry – the Creative Business Cup’ Global Finals. Following the invitation to partner the initiative and in a gesture of solidarity, the National Entrepreneurship and Innovation Plan (NEIP) under the umbrella initiative of the Ministry of Business Development of the Republic of Ghana, endorsed the CBC – Gh and is here today to play a key role in the building up of Ghanaian entrepreneurs. The CBC – Gh competition commenced Friday, February 1, 2019 and was open to collective and independent creative entrepreneurs (established and emerging) who sought professional development and opportunities to network and pitch to investors on a global platform. A total of 126 applications were received, of which 8 were progressed to the finals. In partnership with the Accra Digital Centre, iSpace Ghana, Pitch Hub Ghana, Get Started and StartUp Gh, the CBC – Gh facilitated a 2 day intensive training that equipped them with the basics to prepare their pitch for the finale event. The innovative Grand Finale event was staged and the Silverbird Cinemas (Accra Mall) on Wednesday, March 27, 2019 in an auditorium full of Honourable dignitaries, creative entrepreneurs, media and guests. The distinguished jury included Lawyer John Kumah – CEO, National Entrepreneurship and Investment Plan, David Ofori – CEO, Accra Digital Centre, Lydia Atiemo – Deputy CEO, Youth Employment Agency, Jesse Agyepong – CEO, Get Started/Afiba Consult, and Fiifi Thompson – CEO, Spado Consult. In an address by Laillah Crystal Banda, General Manager for Empire Protocol and Project Manager for the Creative Business Cup: Ghana, it was expressed that “the CBC – Ghana has already exceeded our expectation. Each finalist has put their best foot forward and remained committed to the process. In this short time we have witnessed tremendous growth in the pitches as well as a more bold confidence in their business. Together with NEIP, we remain wholly committed to instituting this as an annual competition and event.” The National Champion will receive an all-expense paid trip to Denmark to compete in the Global Finals from June 28, 2019 – July 2, 2019.